Norichika Aoki (青木 宣親, Aoki Norichika?, born January 5, 1982 in Hyūga, Miyazaki, Japan) is an outfielder for the Tokyo Yakult Swallows. Aoki is one of only three players to amass 200 or more hits in a single season in Japanese professional baseball. He played in the 2006 and 2009 World Baseball Classics as well as the 2008 Beijing Olympics and is widely regarded as one of the most complete position players in Japan today. Aoki was born in Hyūga, Miyazaki, and attended Hyuga Municipal Hichiya Elementary School and Tomishima Junior High School before going on to Miyazaki Prefectural Hyuga High School. Surprisingly, he was a pitcher throughout junior high and high school, converting to the outfield only upon entering Waseda University, where he majored in human sciences. Aoki was surrounded by a remarkable concentration of talent at Waseda: his year included shortstop Takashi Toritani (currently with the Hanshin Tigers), third baseman Toshimitsu Higa (Hiroshima Toyo Carp) and center fielder Shintaro Yoshida (Orix Buffaloes), all three of whom would later go on to the pros. Left-handed pitcher Tsuyoshi Wada (Fukuoka SoftBank Hawks) was one year his senior, and second baseman Hiroyasu Tanaka and first baseman Shinichi Takeuchi, both of whom would later rejoin Aoki with the Swallows, were one and two years his junior, respectively. The six hitters, who often batted in the order of Tanaka, Aoki, Toritani, Higa, Takeuchi and Yoshida, formed one of the most potent lineups in college baseball history and led Waseda to four consecutive Tokyo Big6 titles for the first time in the history of the university. Aoki hit .463 in the spring of his junior year (2002) and set a Tokyo Big6 record for runs scored in a single game with six in a game against the University of Tokyo that season, going 5-for-5 with five RBI and a walk in that same game. He hit .332 during his college career, albeit without a single home run, and was selected to the league Best Nine three times in his eight seasons (spring and fall) with Waseda as the starting right fielder. He was selected in the fourth round of the 2003 NPB amateur draft by the Yakult Swallows. 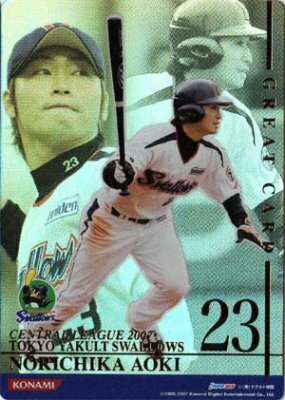 Aoki saw little playing time in his rookie season (2004), playing just 10 games at the ichigun (Japanese equivalent of "major league") level. However, he showed signs of promise in the minors, hitting .372 and leading the Eastern League in both batting average and on-base percentage (.436) and coming second in stolen bases (21). In the Fresh All-Star Game (the Japanese equivalent of the All-Star Futures Game) held that year, Aoki went 4-for-5, coming a home run short of the cycle and winning Most Valuable Player honors for the game. Aoki enjoyed a breakout year in 2005, earning the job of starting center fielder with the departure of Atsunori Inaba. While he struggled in the opening weeks of the season as the Swallows' No. 2 hitter, striking out uncharacteristically often, he slowly began to collect hits at his usual pace and was promoted to the leadoff role by June. On October 6, he tied the Central League single-season hit record of 192 (set by Robert Rose in 1999), following up the feat by becoming only the second player in NPB history after Ichiro Suzuki to record 200 hits in a single season on October 11. While Aoki missed Suzuki's NPB record for hits in a single season of 210, he finished with a league-record 202 hits (his 169 singles were an NPB single-season record). He led all Central League players in batting average (.344) and hits and was voted the league Most Valuable Rookie. Aoki was chosen to play in the inaugural World Baseball Classic as a member of the Japanese national team in 2006.. He was made his second All-Star appearance in July and was named the Most Valuable Player in Game 1 (held at his home park, Meiji Jingu Stadium), becoming the fourth player in NPB history to win both Fresh All-Star Game and All-Star Game MVP honors. Though he came up short in his goal of reaching 200 base hits and winning the batting title for the second consecutive year, Aoki finished the season with 192 hits, leading both the Central and Pacific leagues. He cut down on his strikeouts and drew more walks than in the previous season, improving his on-base percentage from .387 to .396 despite a lower batting average. He also hit more home runs (13) and drove in more runs (62), leading the league in both average with runners in scoring position (.399) and stolen bases (41) for the first time (and putting an end to Tiger center fielder Norihiro Akahoshi's five-year streak of leading the Central League in that category). On December 25, Aoki publicly stated his intent to eventually play in the major leagues via the posting system, saying, "...I would like to move to the majors after some years. It might be difficult to do so as a free agent since I'll be over 30 by then." While major league teams have expressed interest in Aoki (especially after seeing him in international play), the Swallows have offered no indication of their willingness to comply with the request as of mid-2009. Aoki and teammate and fellow outfielder Alex Ramírez competed for the batting title at a torrid pace throughout the 2007 season. On July 10, Aoki became the fastest player in Japanese professional baseball history to amass 500 career hits, doing so in 373 games. While he fell short of 200 base hits, partly due to the 80 walks (fourth in the league) that opposing pitchers issued to him, he finished second in the league in hits (to Ramírez, who hit safely 204 times, a new Central League record) with 193, winning his second batting title with a .346 average. Aoki also led the league in on-base percentage for the first time and scored 114 runs (his third consecutive season with 100 or more runs). Meanwhile, his stolen base total dropped sharply from 41 to 17, a decline that could be attributed to then-player-manager Atsuya Furuta's placing Hiroyasu Tanaka (rather than Adam Riggs, as was the case in 2006), a second baseman with little power, behind Aoki in the 2-hole and instructing him to bunt often. On the other hand, Aoki began to show legitimate power, hitting 20 home runs and slugged over .500 for the first time. He was slotted into both the 2- and 3-hole numerous times and even hit cleanup in Furuta's retirement game as a player on October 7. Aoki played in the Asian Baseball Championship as a member of the Japanese national team that December, helping Japan clinch a berth in the upcoming Beijing Olympics. On May 5 2008, Aoki was scratched from the lineup and sent down to the minors due to an oblique strain. It was his first time missing playing time due to injury since his debut at the ichigun level. However, he returned some three weeks later on May 29, engaging in another race for the batting title, this time with Yokohama BayStars left fielder Seiichi Uchikawa. Aoki was chosen to play in the 2008 Beijing Olympics along with teammate Shinya Miyamoto as a member of the Japanese national team in August. After he returned to the Swallows, manager Shigeru Takada opted to use him in the 3-hole permanently, slotting newly acquired left fielder Toshiki Fukuchi into the leadoff role instead. While Aoki relinquished the league lead in both batting average and on-base percentage to Uchikawa, he finished the season with a personal-best batting average of .347, striking out just 47 times (fewest in the league among qualifying players) and swiping 31 bases (second to Fukuchi on the Swallows). Though he hit well in the second World Baseball Classic, Aoki struggled in the opening weeks of the 2009 season, hitting just .233 with a .316 on-base percentage in the month of April. He got hit in the head by a pitch thrown by Chunichi Dragons closer Hitoki Iwase on April 30, but was found to have no serious injuries upon being diagnosed at a hospital. Aoki was named to the Japanese national team for the first time in early 2006 for the inaugural World Baseball Classic. After being relegated to the bench and seeing little playing time in the first two rounds, he was named the starting center fielder in the semi-finals against South Korea and finals against Cuba, but went 0-for-4 in those two games and finished with just one hit in five at-bats in the tournament. Nevertheless, Japan defeated Cuba 10-6 in the finals to become the inaugural tournament champions. Aoki played in the 2007 Asian Baseball Championship (which also functioned as the Asian qualifying tournament for the Beijing Olympics) as a member of the Japanese national team. Though he was 0-for-9 with one sacrifice bunt in the first two games against the Philippines and South Korea as Japan's No. 3 hitter, he went 3-for-4 with a double and a walk in a 10-2 mercy rule win in the final game against Taiwan, helping Japan clinch a berth in the upcoming Olympics. Aoki played in all nine games in the 2008 Beijing Olympics as Japan's starting center fielder, batting in each of the first three spots in the order and hitting .294 (10-for-34) with seven RBI and scoring five runs. Japan dropped the semi-finals against South Korea, though, and despite a go-ahead three-run home run by Aoki in the third inning of the bronze medal match against the United States, Japan went on to lose 8-4 in a disappointing fourth-place finish behind South Korea, Cuba and the United States. Aoki played in the World Baseball Classic for the second time in 2009, having no difficulty playing left field despite manning center field almost exclusively for the Swallows. He played in all nine games, hitting .324 (12-for-37) with seven RBI as Japan's No. 3 hitter, and had a pivotal role in Japan's repeat as tournament champions. Aoki was one of three outfielders named to the All-Tournament team. Listed at 175 cm (5 ft 8 in) and 80 kg (176 lb), Aoki is described as a protoypical contact hitter for his ability to spray the ball to all fields and utilize his speed on the bases to stretch singles into doubles and doubles into triples. Slotted into the 2-hole in front of current Tigers shortstop Takashi Toritani, Aoki became adept at hitting infield singles to the left side of the infield to get on base during his years at Waseda University. He carried that same approach into the pros, going the opposite way for infield hits and singles to left field so often that teams began employing an "Aoki Shift", with the third baseman playing shallow and the shortstop shading the 5-6 hole, until 2006. Aoki has developed more power with each successive season and has now established himself as a legitimate middle-of-the-order threat that can pull the ball as well as hit for a high average (.333 career batting average as of May 13 2009). He is known to be slightly unusual in that he has several different batting stances in his repertoire. While most players shape their mechanics to perfection, Aoki does not hesitate to switch from one stance to another when he runs into hitless stretches (though he holds his bat much more upright than he did earlier in his career). He has attested to the importance of lower body movement to his hitting in interviews. On the defensive end, Aoki has earned a reputation as a superb center fielder with excellent instincts and range, winning three consecutive Golden Glove awards from 2006 to 2008 and leading all outfielders in the Central League putouts in 2006 and 2007. His throwing arm is accurate, if not especially strong, and he has a very quick release.